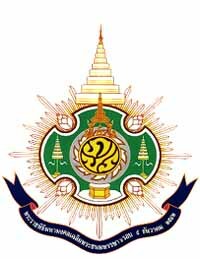 Name: The Royal Ceremonial Emblem on His Majesty the King's 6th Cycle Birthday Anniversary, 5 December 1999. Definition: His Majesty the King's initials, placed under the Royal Crown and above the eight-sided Royal Throne, signifies that His Majesty the King is the focus of the entire nation, a unifying force who commands the deepest love and respect among his subjects. The letters are in yellow, the colour of the day of His Majesty's birth, Monday, against the background of deep blue, the royal colour. This is surrounded by the discus-emblem of the Chakri Dynasty and the Thai numeral 9, signifying the 9th Reign of the Chakri Dynasty. The crest is flanked on both sides by seven-tiered royal umbrellas, and topped by the nine-tiered royal umbrella. The border is divided into four parts, representing the four regions of the country, in green, the colour of peace and abundance. A lotus is featured on each of the four points, as an offering to His Majesty the King on the occasion of His Majesty's 6th Cycle Birthday Anniversary. The golden rays around the crest signify His Majesty the King's grace and benevolence, recognized throughout the Kingdom and beyond.